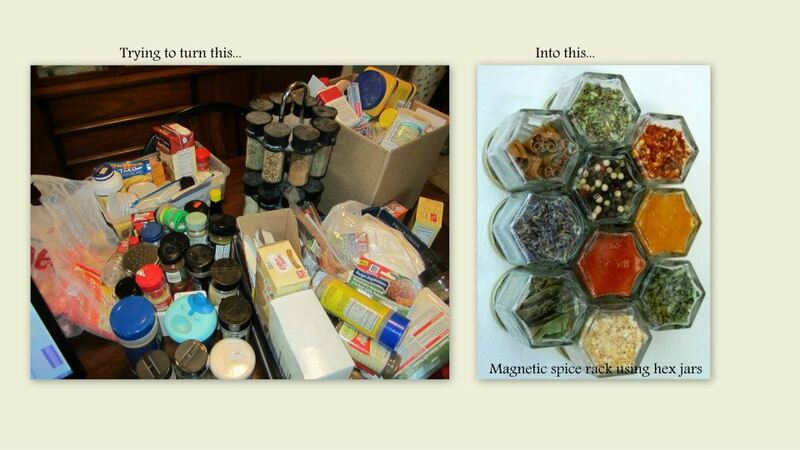 This week I am working on my organizational spice rack idea for our low cost kitchen makeover project. I pulled inspiration from a random photo I spotted online using hex jars with magnets in the lids. I originally was going to use baby food jars but found out (after washing 40 of them and scraping the labels off) that baby food jar lids do not screw back on straight or tightly enough so we had to scratch that idea. I found a great company online that sells hex jars for candle making and they had various sizes, I chose their 4 oz size. I figured 4 oz was just the right size for us, not too little or too much, I needed the jars to be small enough to not become a sore thumb in my perfect kitchen vision. I carted all my herbs, spices and a few baking items over to the dining room table...I was in shock! I had no idea we had become spice hoarders LOL! My spice rack was super dusty from sitting on a shelf in my breezeway, that just shows how little space we have in our little kitchen. My toddler was pretty excited to see it all, he even added his sippy to the mix hehe, you can see it in my photo below. At first I was all excited and sat down to immediately begin organizing, I mean how hard could this be? UGH! Once I started going though everything I quickly gave up and decided to go do something else for a while, my eyes were about to pop out of my head. It looks all simple when you see the cute magnetic spice rack ideas online but then actually doing it in person was a whole other experience. I will update when I get a little further along! Next day...I finally had the enthusiasm to begin and my toddler was napping so I had some "free" time. I sat down and started pouring everything into the cleaned glass jars, screwed the lids on and in permanent marker wrote down what they were. I wish I had laid down some paper towel or a cloth because it made a HUGE mess and I was covered in cinnamon and garlic powder when I was finished. I am still not 100% sure on how exactly I want to label these. I thought I'd use cute printouts I found online but there were not enough and I'm not a graphic designer. I also thought I could just write in permanent marker on the bottoms but that wouldn't look so nice, I don't have the greatest handwriting. I am thinking I want to get a label maker of some sort and use black print with clear labels. I'd put those on the bottoms of the jars, the part that faces out. I have a lot of rare Earth magnets called neodymium magnets. I currently have a 1/2" x 1/16" size but I really think I am going to need a larger one, maybe a 1" x 1/16" would do it, or I could double up the smaller ones inside the lid. I am still working on getting these crazy strong magnets apart, they are SO strong! Until then I still have to figure out how we will be doing the back-splash. My idea was to get sheets of stainless steel and have it go either halfway up the wall or all the way to the bottoms of the cabinets...not sure yet. Thanks for coming along on my little kitchen makeover project! 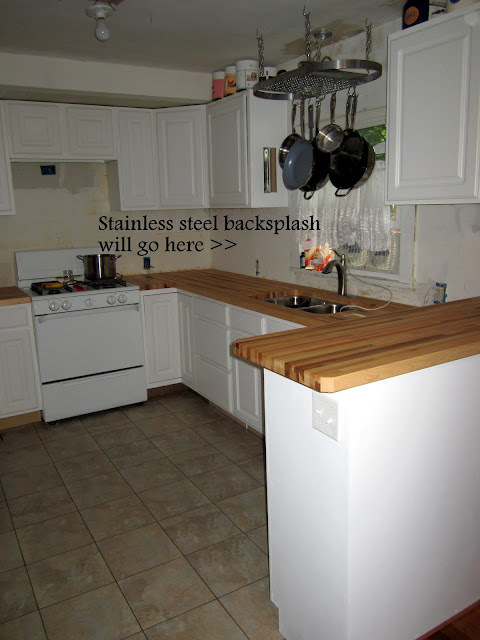 If you are working on your kitchen and blogging about it, please leave me a comment with the link!